Grocery store rituals. Everyone has them, from when they shop, to which stores they prefer, reusable bags or always forgetting them, do you browse or go straight for the items on your list, if you even made a list. And I would guess that we are all pretty consistent with these habits. One of my rituals is stopping at grocery stores I haven’t shopped at before, so I can search items on my “Can I Find” list, which contains about 10 items I am on the prowl for. Some of the items are things I grew up with in Philly, some that my mom, Queenie, swears by, and some that I have had while traveling and I’m hoping to find again. One of the things on my list is Heath Bar Cookies at Publix, which are by far the best store made cookie on the shelves. Queenie has spoiled my husband with them, every visit she is sure to bring him a package. He has a long distance love affair with this toffee cookie. In between visits I try to find ways to satisfy his toffee tooth. 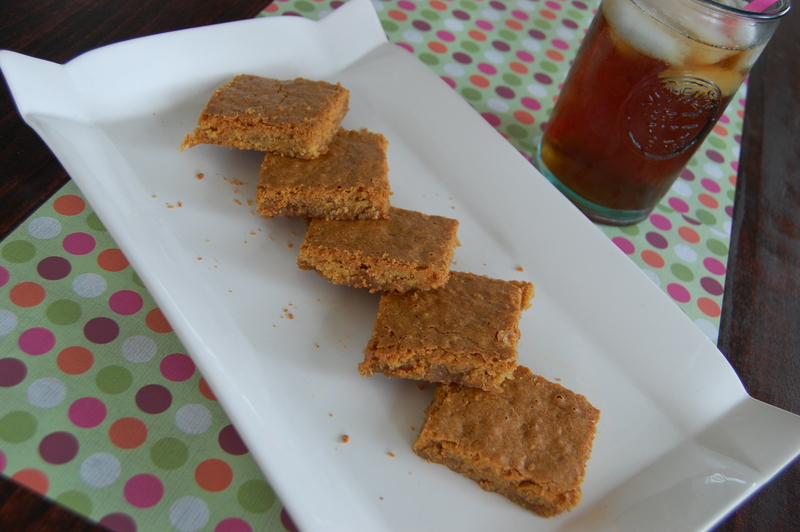 These bars came out pillow soft and chewy, very similar to the beloved Publix cookie. The amount of salt is perfect complement to the sweet toffee. 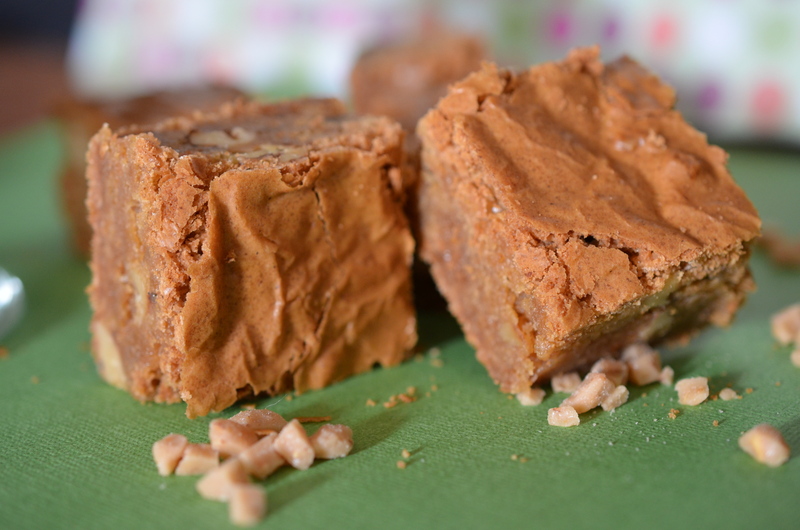 Salt and toffee should never be separated from each other. The nuts can stay or go, pending if you are a nut fan or not. Preheat the oven to 350 degrees F. Spray an 8-inch-square baking dish with cooking spray and place a piece of parchment paper over the pan. Give the parchment another spray coating it evenly. 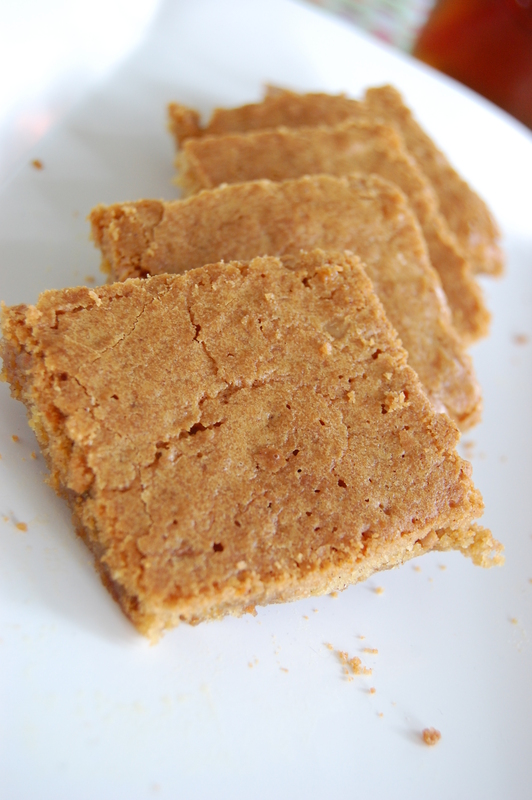 In a medium saucepan melt the butter over medium heat; stir in the brown sugar until smoothly melted. Remove from heat and let stand 5 minutes. Now in a medium bowl, whisk together the flour, baking powder and salt. Freshen the walnuts by toasting them in a medium skillet over medium heat, 6 to 8 minutes until fragrant; remove from hot pan to cool. Beat in the eggs, one at a time, into the cooled butter-sugar mixture, next whip in the vanilla. Stir in the flour mixture and mix until combined. 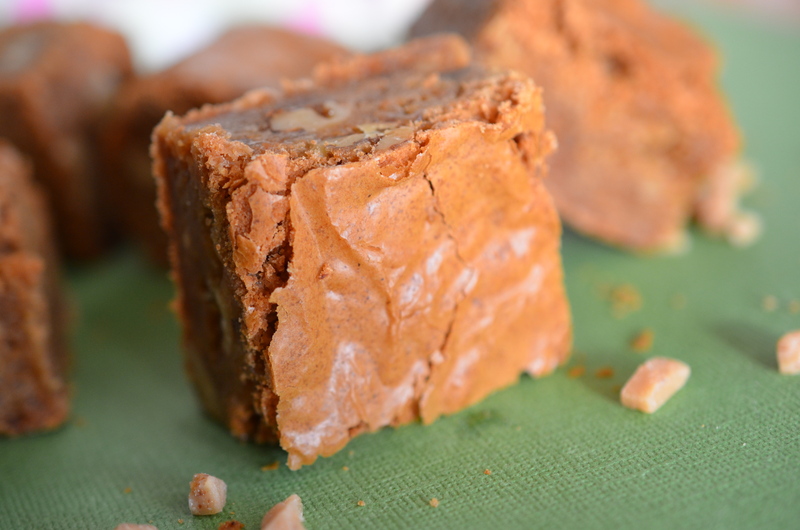 Gently fold in the toffee pieces and toasted walnuts into the thick batter. Spread the batter in the parchment lined pan. Bake until golden brown and a toothpick inserted into the center comes out clean, about 45 minutes. Let cool 15 minutes, lift out of the pan and cut into 1 inch pieces. 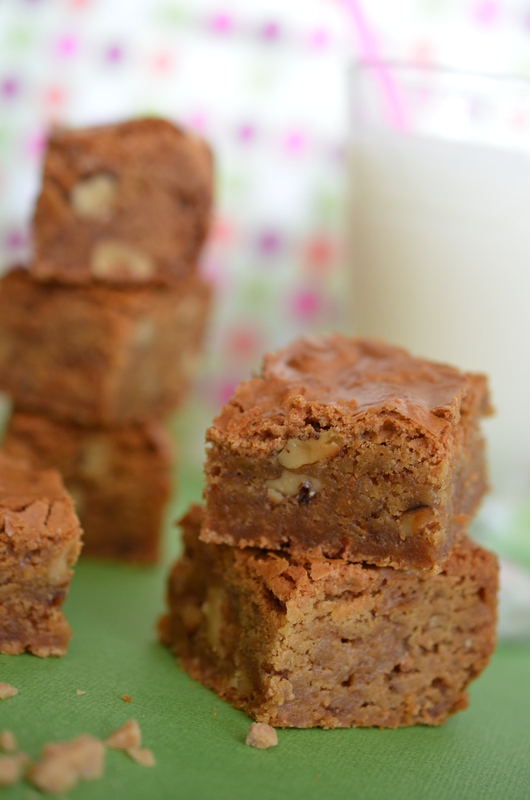 Makes about 16 chewy, gooey, salty, sweet treats. I don’t think I will ever be able to walk into a Publix without looking in the bakery for the Heathbar cookies, they are a permanent item on the “Can I Find” list. I know we can buy them in South Carolina when we visit Queenie’s, or get them when she visits us, but the hunt is fun, the idea that one day I’ll find an item on my list is great! 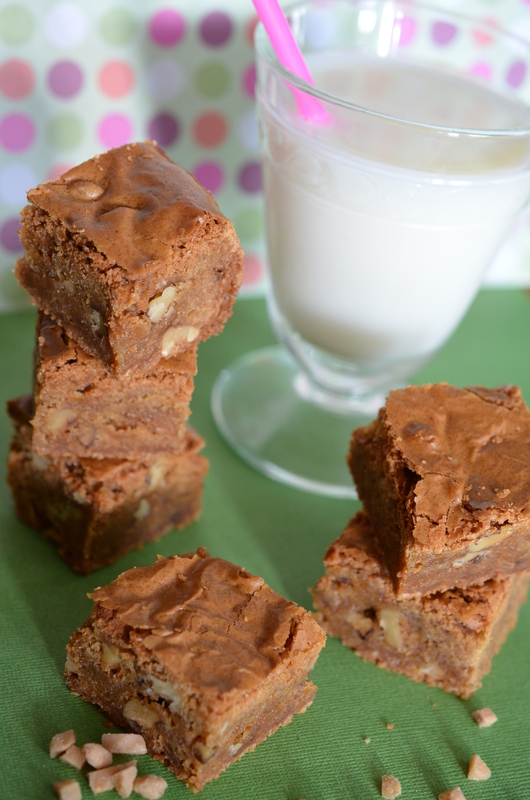 In the meantime these Chewy Toffee Bars are a welcomed substitute! Queenie, this does not mean you don’t need to continue supplying Sir Wes’ love affair. I am a carrot cake snob, put a good piece in front of me and I will savor every bite; unfortunately it isn’t too often that I meet a carrot cake that qualifies. I didn’t even like “that vegetable cake” before I had the mouth-watering bite in Jacksonville about 9 years ago, and since then I’ve looked for its match, only to be disappointed. Carrot cake is tricky to make, many are too dry, too sweet, too much spice, too much icing, the wrong icing…I don’t judge, I am not a pastry chef, I just want that stinking good carrot cake again! Preheat the oven to 350F. Combine melted butter, sugars, vanilla, cinnamon and ginger in large mixing bowl and blend. Add eggs one at a time, mixing thoroughly after each addition. Slowly add flour and salt, until incorporated. 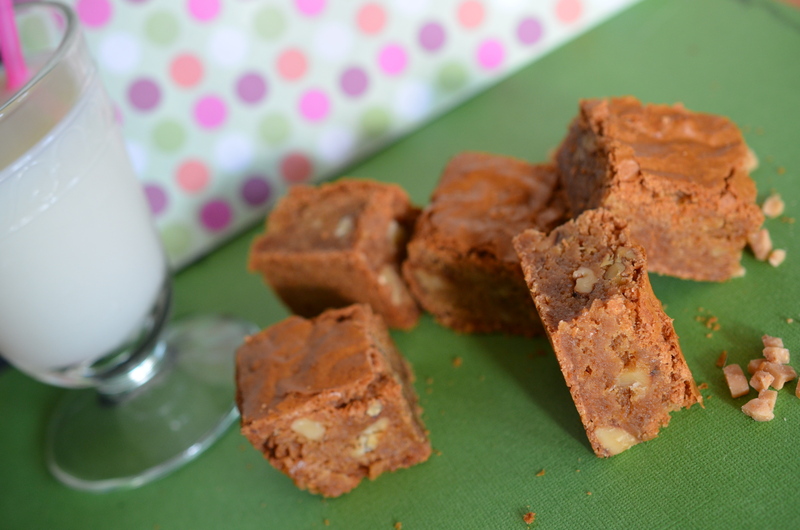 Mix in carrots and toffee pieces. Line rimmed baking sheet with parchment paper and spread the batter evenly. Bake on for 45-50 minutes, until golden in color. 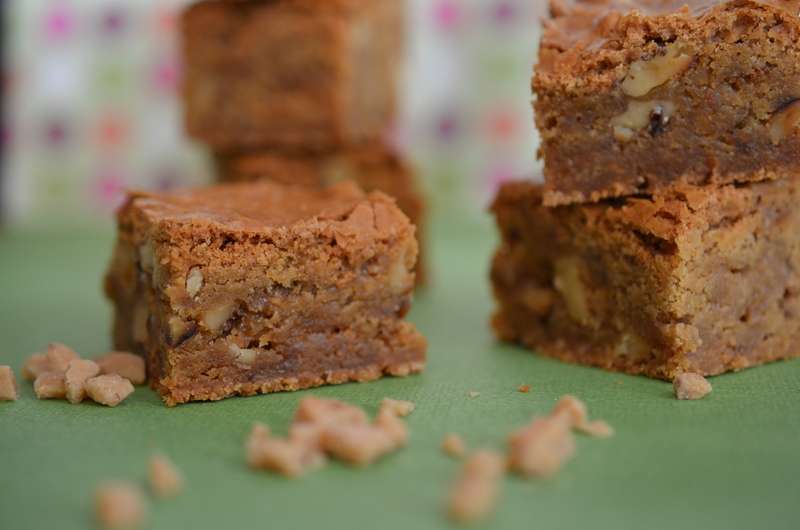 Allow blondies to cool before cutting into squares. 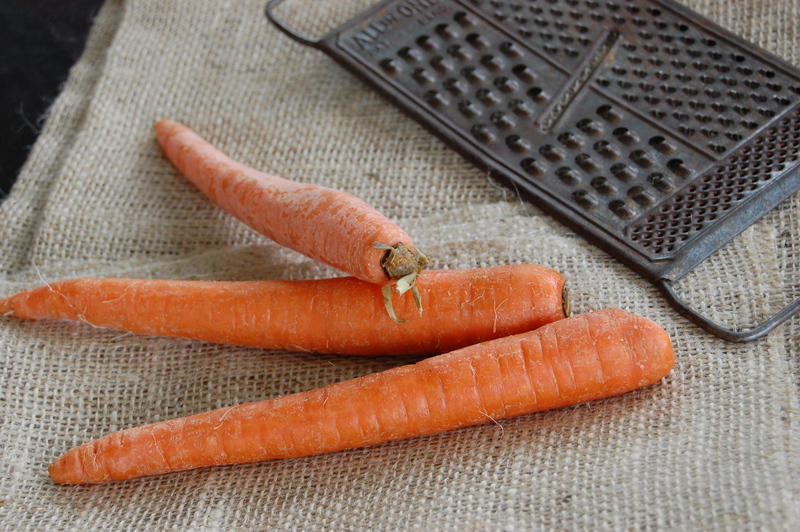 Vegetables in Dessert- Think of it as an efficiency! 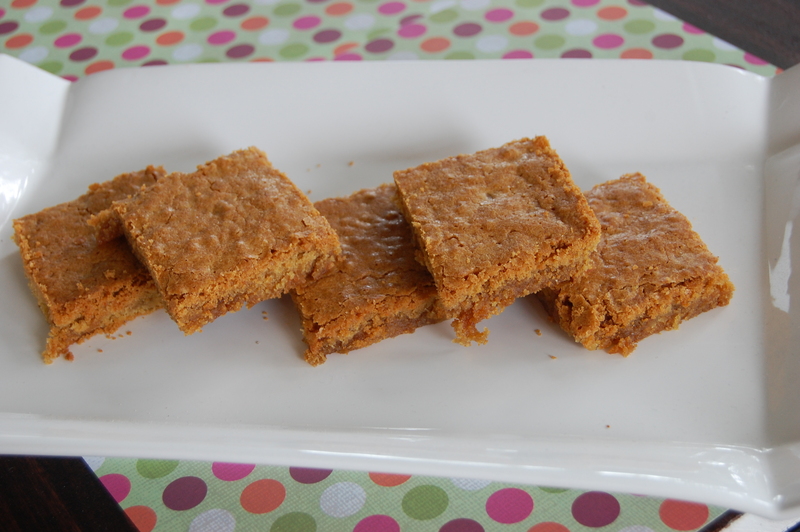 Carrot and toffee are a complementary combination, add a pinch of salt in and there is the icing on the cake! 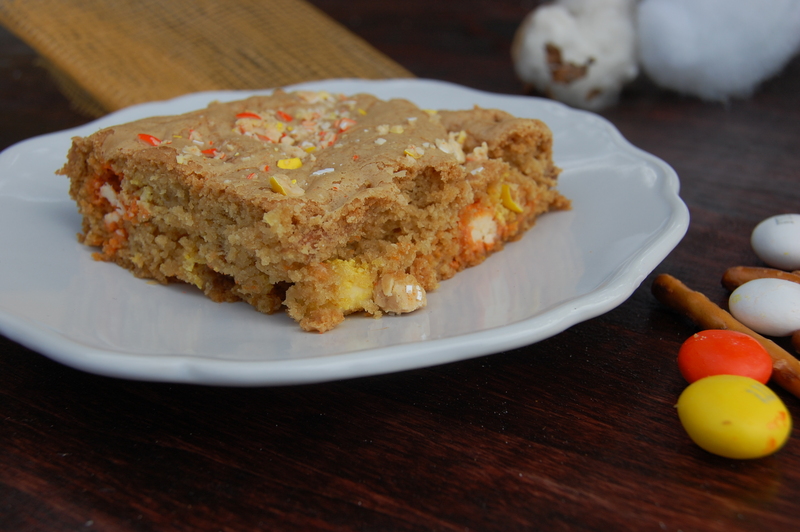 Candy Corn M&M’s and Pretzel Blondies! National Candy Corn Day!! 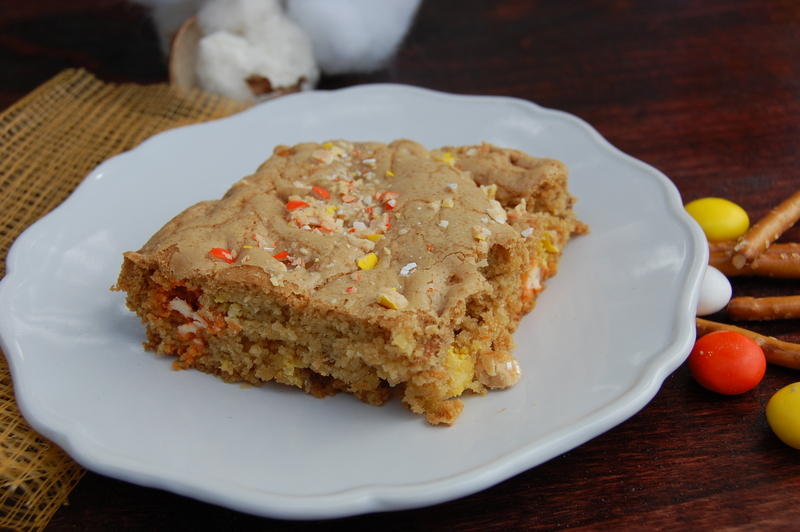 Candy Corn M&M's and Pretzel Blondies! It is National Candy Corn Day, very convenient as the Halloween Candy is starting to be on sale! I saw this little treat at The Little Kitchen and could not resist!! I thought I would add some pretzels instead of the suggested pecans- I love adding salty to sweets! A few sun-dried cherries would also be delicious! 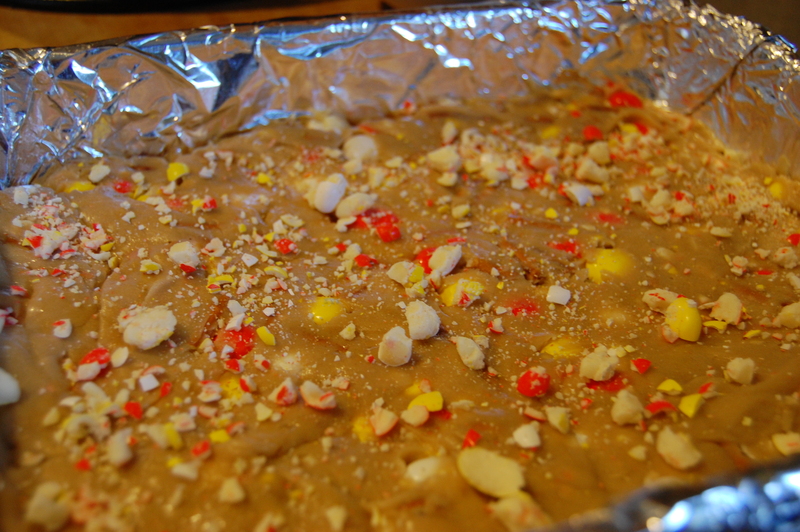 Sprinkle some crushed M&M's and Pretzels on top before you bake! Take an 8×10-inch baking pan and cover in foil and spray with baking spray. Mix brown sugar and egg until it is well mixed, add vanilla and melted butter stirring until well combined. In a separate bowl, mix dry ingredients, flour, baking soda and salt. Slowly add flour mixture to the wet ingredients, stirring until all is incorporated. Gently fold in pretzels and M&Ms (Reserve a tablespoon of each). Add batter to the pan, it will be thicker than a brownie or cake- you will have to spread the batter in the pan. 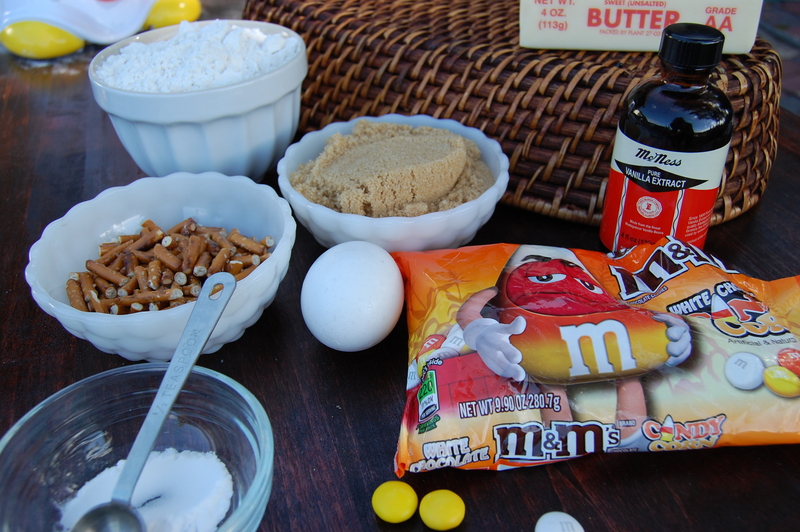 Sprinkle some crushed M&M’s and pretzels over the top. Bake for about 25-28 minutes until the top is golden blonde! Allow to cool for about 10 minutes and remove gently from pan. Celebrate National Candy Corn Day and many Happy Haunts!